220 Mc would appear to have been all but forgotten since June 22, 1959 when W6NLZ and KH6UK worked 2540 miles across the Pacific. Except for K1YON, and occasionally one or two other chaps, my 220 portfolio is bare. Perhaps it is because of the odd harmonic relation from another v.h.f. band (but so is 144), a belief that 220 propagation is uninteresting, or channel 13, but I’m not so sure these aren’t excuses rather than reasons. Look at the 220 standings, compare them with 432 for states and distances worked, and activity. There has never been a reported meteor scatter contact on 220, and only one or two e.m.e. attempts that apparently didn’t go beyond the planning stage, although I believe one fellow built a large array only to find no one to schedule. Aurora has successfully been worked on 220. Many of the 144 Mc weak signal and m.s. stalwarts have worked everything they can, short of an e.m.e. system. It seems a shame for this talent to work over and over the same stations when another v.h.f. band goes wanting for occupancy. M.s. can be worked on 220; K4QIF has heard bursts from W4GJO on 432! The trail ionization will have to be higher than for 144, but the high velocity Lyrids, Perseids, Orionids and Leonids showers should be capable of supporting m.s. Random work could prove as interesting on 220 as it is on 144. R.f. isn’t hard to come by, neither are antennas or converters. Anyone besides K4IXC interested? Jack Wilson, W1QXX, Arlington, Massachusetts says most of New England’s 220 Mc activity is on Tuesday nights. Jack lists nearly 20 stations active during one recent session, and W1HDQ and K1YON added a few more calls to the list. Jack sent me a list of frequencies if anyone needs it, but most everyone in. his area is in the first 200 kc. K8AXU is ready in Ohio, and I think we could get W8PT/4 to put South Carolina on 220. How about other areas? The first recorded 220-MHz meteor scatter contact has been made. And the second. And the third. On August 9, after two months of daily schedules, Mel Baer, W6WSQ, and Don Hilliard, W0EYE, completed the first 220 m.s. contact on record. The contact was made between 1130 and 1315 GMT. They began scheduling on June 10 hearing pings and bursts of up to 12 seconds on nearly every day. The distance is approximately 825 miles [1327km]. Signal levels were typically 10 to 15 dB above the noise and the maximum burst duration was about 15 seconds. K4IXC and K2CBA made the second 220 m.s. contact two days later, August 11 at 1600 GMT, on several similar bursts. Their exchange establishes the 220 m.s. distance record at approximately 1090 miles [1754km]. On August 12, W6WSQ and W0EYE worked for the second time, between 1130 and 1430 GMT. W6WSQ also scheduled W7JRG August 11 through 13. No contact was completed, but W6WSQ received three bursts from the Montana station on the 12th and W7JRG heard W6WSQ briefly on the 13th. Power input at the successful stations varied from 400 to 1000 watts, antennas were Yagis. W0EYE, at Boulder, Colorado, used 400-watts input, a single 13 element Yagi and a Nuvistor converter. W6WSQ, near Los Angeles, was running a pair of 4CX250Bs at a kW, a single 13 element Yogi 45 feet high and a 417A converter. K4IXC, Melbourne, Florida, runs a kW and a pair of 17 foot long 12 element Yogis stacked 3 wavelengths at 100 feet. K2CBA, near Albany, New York, has a pair of 4CX300s at a kW, a single 13 element Yagi 110 feet high and a 417A converter. While high power was used by those making contacts, we also note that K4IXC heard WA1HHK, near Boston, running approximately 15 watts output. 220 MHz news is topped-off with the first three m.s. contacts on this band. 220 may well be the highest frequency where amateur meteor scatter is possible. A study of radio echoes from meteors done at the Massachusetts Institute of Technology indicates m.s. signals at 432 would be some 18 dB below the 144 return. This is not to say we shouldn’t try, but those of us with less than the absolute optimum in 432 equipment might as well stay in bed. Who is going to prove me wrong? K4IXG and VE3EZG may be scheduling by now. After several weeks of schedules, K4IXG and K4GL worked by tropo on August 24, 500 miles. W0DRL, Kansas, has 300 watts output, and is ready for schedules. A detailed letter received from George Kass, 7-17 Parsons Blvd., Malba, New York 11357, described his station built around a kW and 13 element Yagi. George forgot to give ins call, but says be will accept 220 m.s. schedules. METOR scatter (m.s.) at 144 MHz has been well exploited in the past dozen years, and random m.s. has received much attention in the last two years. We have found 1000 mile m.s. contacts possible almost any night we keep a schedule. There are still non-believers, but midwestern 2-meter men are changing that. Few amateurs have tried m.s. above 144 MHz, but as reported last month, four stations have been successful at 220 MHz. A handful of operators are now exploring 432 m.s. possibilities. Is an m.s. contact at 432 likely? Some schedules have been kept, but without positive results. Pings have been heard. Whether or not they were of meteor origin is questionable. Lightning-originated pings would more likely be the case. I would be amiss to say that m.s. is not possible on our lowest u.h.f. band, but let us examine the results of a 440 MHz radio-echo study at the Massachusetts Institute of Technology. Their transmitter ran 2 megawatts, the antenna was an 84 foot paraboloid with 37.5 dB gain over isotropic. The receiver had a 3 dB noise figure and 200-cycle bandwidth. MIT observed some three thousand meteors, 90 percent had durations of less than one-half second! They concluded that (a) the detected meteor height at 440 MHz is substantially the same as at a lower frequency, so path distance would be the same; (b) the effective scattering length of the trail is short, due to an almost immediate expansion of the ionized trail, the required ionization is therefore rapidly dissipated. The power difference between 2 megawatts and 1 kilowatt is about 32 dB. You’ll have to measure your own antenna gain, but converting the figures to the best the amateur is likely to produce, we should expect no more than one ping every six to eight hours on random meteors at 432 MHz! Of course, the number of echo returns would be greater during a meteor shower. MIT concludes, however, at this frequency echoes are returned only from a small region close to the meteoroid head. At 144 MHz the return also comes from the ionized trail, which, at 432 is almost non-existent. The slow-velocity Quadrantid and Geminid meteors appear to be the only ones worthy of exploration with amateur power levels. The possibility of a 432 MHz m.s. contact is remote, but it does, indeed, present a challenge to the serious worker. Aurora at 432 was thought impossible until two years ago. Will a 432 m.s. contact be made? The full MIT report may be found in the Journal of Geophysical Research, Volume 70, Nnmber 21, November 1, 1965. Pulsars - Signals from Stars? The pulsar radio signals discovered last summer by radio astronomers at England’s Cambridge University Mullard Radio Astronomy Observatory have stirred interest among amateurs. The extremely regular signals are emitted from four different locations in space. Three pulsars radiate r.f. energy at precisely 1.33 seconds, the fourth known pulsar has a 0.25-second rate. Their origin is believed to be within our galaxy, but at a distance of several hundred light-years. There has been speculation that the signals are being transmitted by an intelligent being, but the amount of electrical energy needed to produce the signals tends to make this explanation unlikely. Rather, growing conviction among radio astronomers is that the signals originate in white dwarf stars. White dwarfs are thought to be dying stars collapsed to a density thousands of times greater than water. Kitt Peak National Observatory has visually located a star believed associated with one of the pulsars. Further visual studies are underway. The British scientists announced their discovery several months after detecting the first of the signals. 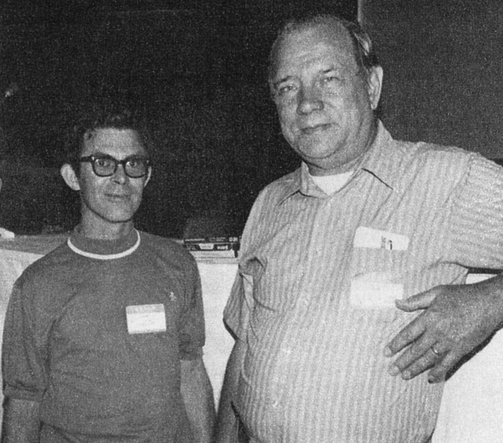 Alan Parrish, K1KKP/2, Ithaca, New York was apparently the first amateur to receive the signals. 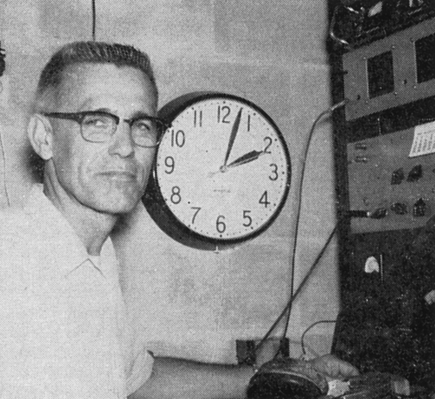 He did so on the 2-meter band with a pair of 10 element Yagis and an intensity-modulated oscilloscope described in his January, 1968 QST article. It is worthy of close inspection for this and other weak-signal detection applications. Parrish says the pulsars may also be heard on a large array and a receiver with filtered output into a speaker having good bass response. What frequency? The signals have been detected higher than 1400 MHz, and in fact, begin above that frequency, swishing down the spectrum at a rate of 30 MHz. per second at 144 MHz. K1KKP says the signals have an apparent instantaneous bandwidth of about 1 MHz. There has been only limited material published on these signals. The interested reader is referred to Sky end Telescope, july, 1968. Position information is available there, or I can furnish that information to the serious worker, allowing at least two weeks for processing. Most of us will not be able to detect the pulsar signals, or hear meteor pings at 432 MHz, but this month’s material is intended for those who believe they have good systems to prove it. The World First 432 Meteor Scatter QSO - 12th August 1972! W0LER (left) and W2AZL made the first 432 MHz meteor scatter contact August 12. The exchange required 5 hours to complete, on infrequent short bursts. After countless hours of schedules by several hardy meteor scatter buffs over the past three years, a 432 MHz meteor contact has finally been made. W2AZL, Holmdel, New Jersey, and W0LER, Minneapolis, were able to put together enough short bursts August 12 to lay claim to the “first.” Before completing the contact, they ran more than 30 hours of schedules, beginning in July and hearing something on each try. As on previous schedules, the successful August 12 schedule began on 144 MHz for calibration purposes, exactly tripling their 144 frequencies to locate each other on 432 with precision. The 432 schedule began at 0600 GMT, and required 5 hours and 4 minutes to complete. The distance is 1000 miles. Both stations used kilowatt amplifiers and Yagi arrays. Sequences of 2, 5 and 15 seconds duration were employed to make maximum use of the infrequent bursts. W0LER received a string of confirming Rs from W2AZL at 1104 GMT. Both W2AZL and W0LER said they appreciate the work in previous years by W4FJ and W0DRL, from whom they learned techniques which led to the contact. Congratulations to Carl and John - and the others who paved the way for what is the highest frequency meteor scatter contact on record.